IIT Bombay’s premier business plan contest, Eureka! 2007 got under way last week and submissions for the three-month event closed on 2 October. The event offers three winning teams a total cash prize of Rs14 lakh, and the winners will be announced in February 2008. 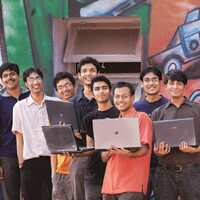 The event is part of an all-year initiative by IIT Bombay’s student-run Entrepreneurship Cell that aims to create a supportive ecosystem for young entrepreneurs (for a detailed account of the eCell’s initiatives, read our 2 October story, ‘Building a start-up ecosystem the IIT way, at www.livemint.com). • 1,670 applications received across 21 categories, more than double of total applications received last year. • 600 applications were from students and the balance from working professionals. The contest was opened to working professionals at Eureka! 2006. • Applications in the rural category, a new feature this year, numbered 178. • First round of judging applications has commenced. Judges include Avnish Bajaj, Matrix Partners India; Alok Kejriwal, Contests2Win; Sandeep Murthy, Sherpalo Ventures; Vishal Gondal, Indiagames; and Rahul Khanna, Clearstone Venture Partners. • Phase II, an intensive mentoring programme, begins on 5 November for the 40 shortlisted applicants, who will have to draft their business plans by 30 November.